This page describes my experience with GNU Radio and GRC. This page originally detailed how to build GNU Radio and GNU Radio Companion from source, but this proved very difficault for some people to follow, so this page suggests how to install the binaries instead. It is very closely based on Install GNU Radio on Ubuntu 9.10 (Karmic). This will take a few minutes and then you will have GNU Radio & GNU Radio Companion (grc) installed. When I first started GNU Radio Companion, I got the following error trace. Which will setup the required folder, and then put the config file in the correct place. 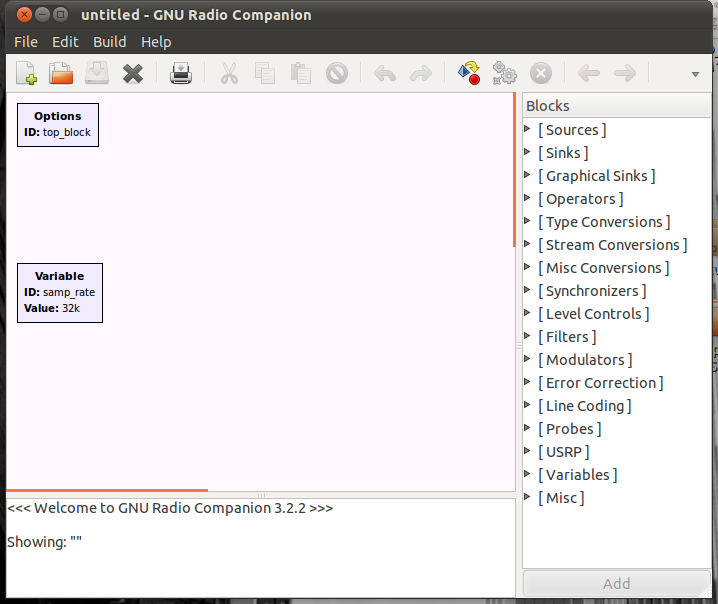 I have not used GNURadio before and so wanted some tutorials to see how things work. I found this website which is very very useful indeed. Having red through the tutorials on that page, it all clicked into place. Playing with GNU Radio made a lot of my DSP and SigProc courses make much more sense. The image below shows my Lower Sideband SSB demodulator, made in GNU Radio using the Weaver method.